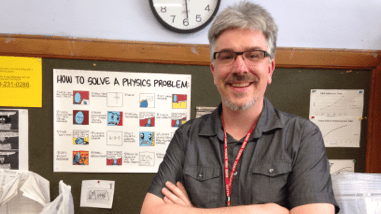 While the 2016-2017 school year is drawing to a close on a predominantly jubilant note, BHSEC has received some bittersweet news: Bard High School’s beloved and esteemed professor of physics, Dr. Nathan Cooper, will unfortunately be leaving us. Dr. Cooper, with a Master of Science in physics and a Ph.D. in astrophysics, plans to take a break from teaching to focus on furthering his own education. Dr. Cooper’s next adventure? Data science. His first task is a summer course in statistics as part of the Harvard Exchange Program. He plans to continue his learning by taking courses in analytics at CUNY. With the knowledge he gains, Dr. Cooper will pursue a career in the programming industry, including processing data for companies in order to better recognize the purchasing and viewing habits of consumers. Though Dr. Cooper continues on to bigger and ventures, his reign at BHSEC will remain. Dr. Cooper provided his students with a large bank of knowledge, not to mention a consistent supply of Navy tales and obscure manga references. Dr. Cooper’s class was always a place for inquiry and curiosity, as Dr. Cooper encouraged his students to do their best work and pursue scientific facts. Dr. Cooper found unique ways to balance learning about scientific breakthroughs of our past with learning about the scientific responsibilities of our future. For evidence of such, one need look no further than Dr. Cooper’s lesson in debunking phony or incomplete executions of the scientific method in today’s “alternative facts.” Dr. Cooper represented a devotion to the truth, even if it just meant emphasizing the difference between “rocket science” and “rocket engineering,” and encouraged his students to follow suit. Mystery shrouds the Cooper legacy to this day. Students are left asking questions: Did Dr. Cooper really meet his wife on World of Warcraft? When did Dr. Cooper find time to read that many Sonic the Hedgehog comics? Is Dr. Cooper secretly a bass player from Pink Floyd? While the third question was answered in a class lesson on sound waves, the rest of the puzzles remain to be solved; perhaps they can be using the scientific method as Dr. Cooper taught it, followed by an abstract, introduction, step-by-step procedure, graphs and conclusion. From the year Dr. Cooper began teaching at BHSEC until this final year, Dr. Cooper has been a stalwart presence on the BHSEC faculty. Seven years later, I am glad to have been able to experience one of Dr. Cooper’s last classes at BHSEC. We wish him good fortune on his future endeavors.